Here at Juno we want to help our clients make the most of the mobile arena, and the only way to do that is to implement responsive designs that can perform across a range of devices. This multi-channel concept means your site works for all users no matter how they choose to browse, offering a high-level experience at all times, being a design ideal that all brands need to take on board. One of the latest to benefit from our expertise in the arena is Go Dine. 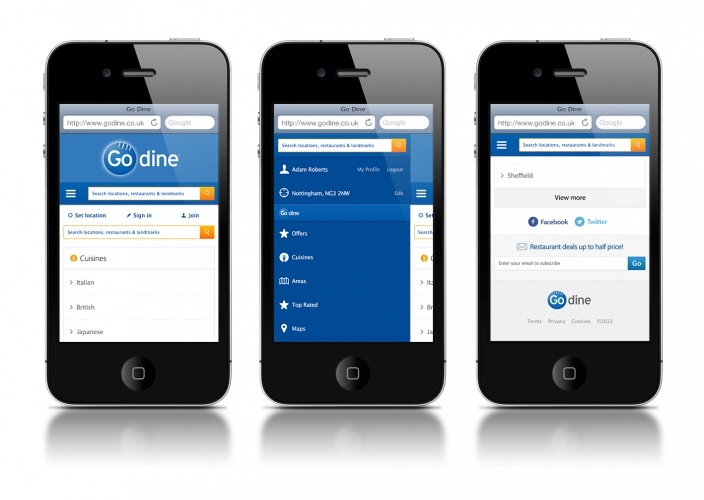 Go Dine is a company that offers benefits for diners as well as restaurants—the site has been specifically designed to help customers book tables and provide information to help them make the right decision, whilst at the same time giving restaurants the opportunity to boost their presence and increase their revenue. Their desktop site boasts a clean layout to keep things simple with all necessary information and categories being easily accessed, and we wanted to create that same kind of result with their mobile version. We think we’ve managed to achieve it. The responsive design offers the same functionality on an even simpler level. Customers are able to search according to location, cuisine or special offers with the results being easily displayed, whilst the clear navigation menus ensure all necessary information can be accessed with ease. Simplicity is key to ensure customers don’t end up having to look elsewhere but we know that overall design is important too, and we think we’ve managed to create a responsive design that perfectly captures the same look and feel of the desktop version for brand continuity with added mobile benefits. Go Dine is just the latest brand to go responsive, so if you want to get in on the action just get in touch and see what we can do.